Air pollution is the largest single environmental health risk and a leading cause of disease and death globally. In the WHO European Region alone, 556 000 premature deaths were attributable to the joint effects of household and ambient air pollution for 2016. Estimates of death and disease from air pollution are the starting point for developing or adjusting policies and measures that protect people’s health. Quantifying the public health effects of exposure to air pollution has become critical to policy discussions. To support this important component of policy-making, WHO/Europe developed the software tool AirQ+. The tool calculates the health effects of exposure to air pollution, including estimates of reduction in life expectancy. On the occasion of the 21st meeting of the Joint Task Force on the Health Aspects of Air Pollution, currently taking place at the WHO European Centre for Environment and Health in Bonn, Germany, WHO/Europe is launching the new AirQ+ version 1.2, now fully available in Russian. 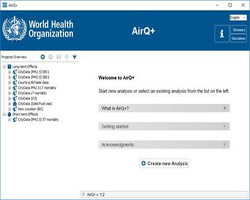 AirQ+ was originally launched on 19 May 2016 in Bonn, Germany, as part of the annual meeting of the Joint Task Force on the Health Aspects of Air Pollution, chaired by WHO within the United Nations Economic Commission for Europe (UNECE) Convention on Long-range Transboundary Air Pollution. In the 2 years since its launch, thousands of users from all over the world have downloaded the software. what changes in health effects would be observed if air pollution levels changed in the future. Version 1.2 of AirQ+ presents an interface in Russian for the first time. The Joint Task Force on the Health Aspects of Air Pollution was established in 1998 within the Convention on Long-range Transboundary Air Pollution to assess the health effects of such pollution and to provide supporting documentation. It provides evidence-based assessment of the risks to health that are related to air pollution, and the attribution of such risks to the long-range transport of air pollution in the atmosphere. This 21st meeting of the Task Force gathers representatives of the Parties to the Convention, as well as experts and stakeholders invited to give presentations on scientific issues on the agenda. Participants will discuss progress in research on air pollution and health, communication aspects, and new international policies and processes relating to air quality and health – particularly the outcomes of the Sixth Ministerial Conference on Environment and Health, held in June 2017 in Ostrava, Czechia, and possible activities to implement the Ostrava Declaration.